Nowadays, AFIS requirements are so complex that they constantly evolve as the scope of adoption domains widens. A major trend calls for well-balanced, technologically mature solutions, which are able to move smoothly along the trade-off curve between speed and accuracy, while at the same time offering high efficiency in relation to use of computing resources. This was the challenge faced, and met, by our system developers. Innovatrics reached an exceptional level of performance and generally excellent results of its AFIS algorithm in the Fingerprint Vendor Technology Evaluation (NIST FpVTE). This proves that our product portfolio integrating benchmarked algorithms is suitable for a wide range of applications: real-time applications with one and two fingerprints, civil AFIS solutions for large-scale deployment, as well as law enforcement AFIS. Moreover, Innovatrics fingerprint matching algorithm reaches a matching speed of 1.04 billion per second on a standard server. 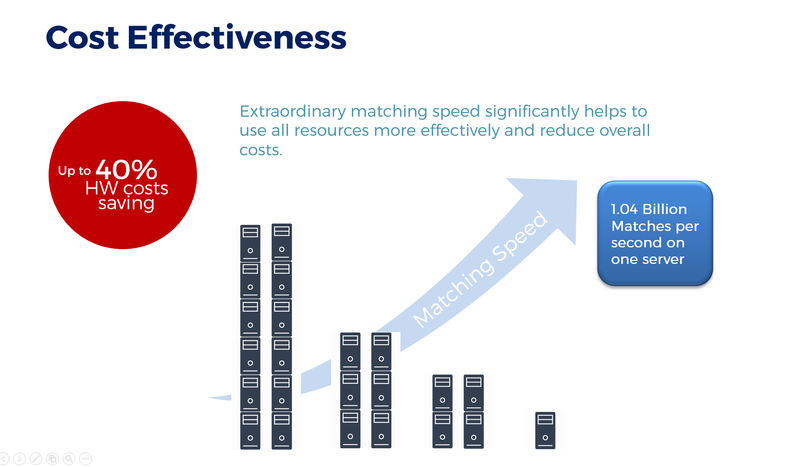 A high-performance algorithm means fewer servers are required to support the solution while maintaining high throughput and very low latency. This results in greatly reduced response times, real-time identification and significant cost savings, especially when we consider very large systems with more than 100 million enrollees. The following table demonstrates the number of servers required based on various different AFIS configurations. Estimated hardware cost saving may climb up to 40%. Continuous innovation has helped us achieve this blazing performance, ensuring that we have stayed ahead of our competitors and that our unique algorithm continues to underpin the strengths of Innovatrics AFIS solution on the market.